Forest Land defined by the United States Forest Service must be at least one acre in size and that is stocked with at least 10% forest trees. There is about 751,000,000 acres of forest lands with in the United States. 249,000,000 acres are owned by the citizens of these United States, managed or miss-managed by the federal government. Timberland is defined as land that can produce commercial wood products, a total of 514,299,000 acres. The citizens of theses United States own 112,799,000 acres and the rest 401,500,000 acres are privately owned. It is a fact that the majority of the timberlands are private property, the majority of which are owned by large corporations. ​ Weyerhaeuser owns the majority of the private timberlands in the United States. This corporation lobbies the federal government to promote timber products harvested from the lands that they own. The management of the public lands both the United States Forest Service and the Bureau of Land Management, are told how to manage the public land by the corporations that owns the majority of timberlands. Looking towards the northeast from the first switch back on the Deadman road. 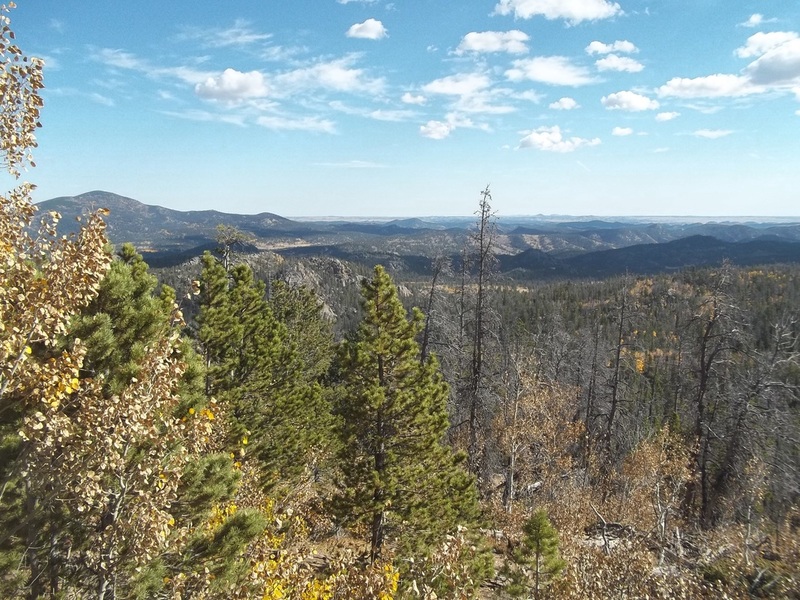 I gazed across this landscape from the Deadman Lookout Station saddened by the gross mismanagement of the national resources by the forest service. Clearly you can see the numerous standing dead tree in this photo as I looked towards the northeast.Loggers started working in this forest in 1865, provide millions of railroad ties. For over one hundred years the trees were select cut, cutting only those that the logger could market. For some reason the forest service decided that the woods needed to be clear cut. Clear cutting involves cutting the majority of the standing trees, which in this case, in this region is unwise to do. Until the change in the harvesting policy it was hard to tell where the loggers had worked. Thinning out the forest by select cutting allowed younger trees to get established, and to mature or grow to a marketable size quicker. In the last ten or so years the forest service has drastically cut the size and number of permits to harvest the timber. Along with all of the federal agencies. The leadership of this agency is dysfunctional, ineffective and has the lack of understanding how to run a business. The Center for Biological Diversity is a non-profit membership organization with approximately 625,000 members and on-line activists, known for its “work” protecting endangered species through legal action, scientific petitions, creative media and grass roots activism. The organization was founded in 1989 by Kieran Suckling, Peter Galvin, Todd Schulke, and Robin Silver. We all have the right to express our opinions. Although I disagree with the thoughts of those listed above, I know they have the privilege to exert their opinions onto the bureaucrats and politicians. We can all agree that we need to do what ever we can to help preserve and protect the earth, the environment and our life styles. Sadly some of those listed above among numerous others have the agenda of obtaining power and money by infringing on our rights. perhaps these biased people need to open their eyes and understand that this nation is based on the labors, the sweat and tears of the common man. Those individuals who ventured from the comforts of the big cities and settled the vast open western lands over the history of this once great nation. The national problem with the forest service, Department of Agriculture and bureaucrats is not limited to Arizona as outlined above, but nation wide. It’s uncommon for someone from rural northeast Washington to testify in front of the U.S. Senate Energy and Natural Resources Committee, where Sen. Maria Cantwell (Wash.) now serves as the ranking Democrat. But on March 24 I had the opportunity to share a story that’s become too common across the Pacific Northwest. My story comes with a message: After years of neglect, it’s time for Congress to restore the health of our forests and rural communities. Our family-owned forest products company was founded in the early 1950s. Through the good times and bad, we've evolved and innovated as the industry and federal forest policies have changed. We've focused on technological advancements and ecologically minded forest management, and have been active participants in collaboration with environmentalists to help resolve contentious issues. Our mills predominately rely on small diameter timber that comes from forest thinning, and the biomass component of forest management activities is utilized to produce renewable energy. The demand for our products is strong. Yet despite our advances and commitment to good stewardship, it is uncertain whether our company, our industry and our workforce will thrive for another 60 years. Like any manufacturer, we depend on a reliable supply of raw materials to make our products. These materials once enabled us to operate three mills and provide 500 family-wage jobs in rural communities in NE Washington. Yet as the federal government shifted to a “hands off” approach to forest management, we were forced to close two of those mills and layoff many valued employees. Our story isn't unique. In fact it’s become common in communities that are near federal forests and rely on the forest sector. The steep decline in federal timber harvests have taken a deep economic toll. It’s partly why, for example, nearly one in four residents of Ferry County live in poverty compared to one in ten King County residents. The health of our nation’s federal forests continues to decline due to overstocking, disease, drought, insect infestations and catastrophic wildfires resulting from a lack of sound management. In fact, the Forest Service says that between 60-80 million acres of National Forest land are at risk. In Eastern Washington, we've seen a marked increase in beetle infestation activity, particularly on National Forests. Last year we also witnessed the largest wildfire in our state’s history, the Carlton Complex, burn over 250,000 acres. Meanwhile, over the past 30 years we have gone from over 600 lumber mills in the Northwest to a current level of approximately 120. Many areas of the country are largely devoid of the forest products industry infrastructure needed to restore and maintain federal forests and provide employment opportunities. In northeast Washington, we still have the mills and contractors needed to defray the costs of federal forest projects. Unfortunately, if something isn't done to increase the level of management on the Colville NF we too will lose mills, jobs and our ability to treat the threats facing this forest. Today collaboration is seen as the model for developing ecologically-sound forest projects. Our community has used it successfully to treat 55,000 acres on the Colville National Forest. But even collaborative projects are hampered by costly litigation and agency analysis paralysis that slow the pace and scale of management. While we haven’t seen lawsuits challenging projects on the Colville, our forest operates under the same broken system that decades of lawsuits, court-imposed requirements, and agency bureaucracy have created. It has also increased the costs of preparing and implementing projects, and the resulting spike in wildfire suppression costs has taken the agency away from its core mission of managing forests for the greatest good. ​ Our communities need Congress to take action on a solution that addresses these barriers for responsible forest management. Otherwise we’ll continue to see an endless cycle of unhealthy forests and communities. Vaagen is president of Vaagen Bros. Lumber Inc. of Colville, Wash.
Vaagen Brothers Lumber Company is a successful, sustainable, eco-friendly logging company. A success story that should be used as an example nation wide. They use "waste" like tops, limbs and bark to fire steam generators to both generate electric power but to kiln dry the lumber.